Utes debut at No. 21 as one of four new teams in the rankings. (Francisco Kjolseth | The Salt Lake Tribune) The Utah women's basketball team comes together following practice at the Jon Huntsman Center on Wed. Jan. 2, 2019, as they prepare for their next game on Friday. The team is having one of the best starts in program history at 12-0. 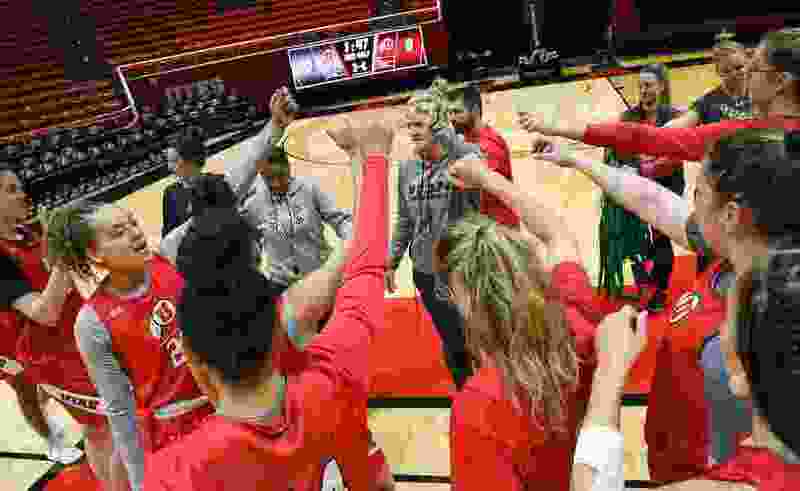 The Utah women’s basketball team received the program’s first Top 25 ranking since 2008, just in time for a demanding portion of the Pac-12 schedule. The Utes became the AP Top 25's biggest story Monday. They not only earned a long-awaited ranking, but debuted at No. 21 as one of four new teams in the Top 25. That was part of the fallout of a week when 13 ranked teams lost. Florida State (No. 22), Texas A&M (No. 24) and Missouri (No. 25) also moved in, while Tennessee, Minnesota, DePaul and Indiana dropped out. Utah had received enough votes to be No. 27 last week. BYU (16-3) is No. 26 this week, with a 10-game winning streak that includes an upset of then-No. 13 Gonzaga last Thursday. The Cougars lost 78-67 at Utah in December before launching their run. Utah (16-1) has matched the best 17-game record in the program’s history, joining the 1997-98 team that started 16-0 before losing. That team, coached by Elaine Elliott, finished 21-6. The current team's only loss came to now-No. 16 Arizona State on a buzzer-beating 3-pointer. Utah will host California on Friday and No. 6 Stanford on Sunday at the Huntsman Center. Next week, the Utes will visit No. 5 Oregon and No. 9 Oregon State. In the Pac-12′s scheduling rotation, the Utes will play those four schools only once each in 2018-19. That gives the Utes something of a break, compensating for their injury issues. Coach Lynne Roberts' active roster already was down to eight players, with the loss of senior forward Daneesha Provo to a season-ending knee injury against ASU on Jan. 4. And then Friday, freshman forward Dre’Una Edwards dislocated her shoulder in a 78-59 win over Colorado. Utah has not updated Edwards' status. Edwards is one of three freshmen playing major roles for the Utes in Roberts' fourth season, joining guard Dru Gylten and reserve forward Andrea Torres. Senior forward Megan Huff leads Utah with averages of 19.6 points and 9.4 rebounds. Utah is 5-1 in the Pac-12, tied with Oregon State for third place after the Beavers lost to Arizona State in double overtime. As evidence of the Pac-12's stature in women's basketball, OSU moved up one spot in the rankings after that defeat. Oregon and Stanford are tied for first at 6-0 in conference play. Even if the Utes lose some ground in the next few weeks, they should remain solidly within the NCAA Tournament projections. Utah has not appeared in the tournament in the Pac-12 era, while never posting a .500-or-better record in conference play. The Utes were picked eighth in this season’s official media poll. They have a 3½-game lead over eighth-place Washington State.